©Bert Gildart: Last week when Janie and I left South Dakota’s Badlands National Park, wildflowers were putting forth a display that is often overlooked by travelers speeding by to other western destinations thought to have more cachet. But from previous experiences, such as the time Janie and I spent creating a Hiking Guide to the Black Hills, we knew the delights such prairie areas could produce. As we explored, we found several dozen species rearing their heads. Though beautiful to behold, they pose a real problem for the photographer, for it is seldom that breezes here in these wide-open expanses ever completely subside. Nevertheless, there are ways to probe the most intimate details of these flowers, but you must understand how to use electronic flashes. Over the past 30 years I have always made use of such lighting for macro photography, once packing around the rather unwieldy and cumbersome Metz Lighting System. I still have that set up, and still use it when extremely high-speed lighting is necessary. But in the past few years, Nikon (and other top manufactures) have produced what they refer to as their Wireless Lighting System. For me, that includes two SB-800 strobes married to the D-300-and this load is sure easier on my aging back. For those who use strobes triggered with wires, most of the techniques that follow apply. In conversing with other photographers who also use the wireless system, we all agree that the actual mechanical techniques are not mastered overnight. That said, once understood the results they can produce are magnificent. Essentially, for several of these images, I went to the camera’s menu and programmed the small on-camera flash to serve in the Commander Mode, which means the light it produces is used only to fire the SB-800s, which are held off the camera. In other words, though the small on-camera strobe will produce a flash, it serves no exposure purpose; it’s only function is to trigger the more powerful strobes one of which is usually held by Janie. The beauty of this set up is that the flowers can be literally blowing in the wind, but still, you can make them appear motionless. You do this by setting the camera to manual and then setting the f-stop to the smallest aperture your lens will support, say f-32 (remember, this is a reciprocal). Simultaneously, you set the shutter speed to the fastest speed your camera will accept for strobe photography, and on my D-300 that is 250th of a second. What that means is that your settings are far different from those you would use if you were relying on the daylight readings your camera’s meter might provide. In daylight, that setting might be 125th of a second at f-16, and that differs from the strobe setting by four to five stops. In other words, the strobe setting so overwhelms the daylight setting that the background goes black. 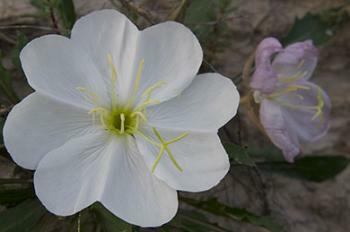 That dramatized the flowers which are exposed by the strobes–and only by the strobes. 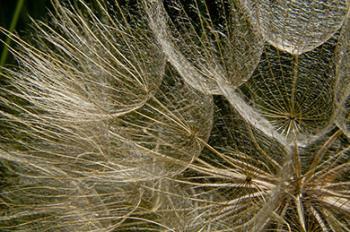 For the photographs of the salsify, Janie held one light behind the plant (backlighting) and so the “parachutes” created a dramatic pattern of repetition. Using the Rule of Thirds, I so positioned the dominate node, allowing the feathery fronds to radiate out from it. 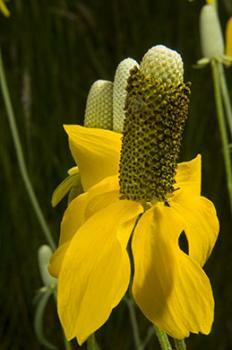 A slightly different technique was used to light the cone flower. Here, I turned off the camera’s built in strobe and mounted instead one of the two SB-800s onto the D-300. I then set that strobe as the commander strobe and set the second SB-800 to “Remote.” Janie held the remote strobe overhead to imitate the sun while the on-camera strobe served as the fill. Shutter speed was set to 250th of a second and my aperture at f-32-for maximum depth of field. In that way the most intimate details of the flower were all in focus and the strobes froze all flower motion that the wind was producing, again, because the flowers were illuminated by the more powerful strobe lighting, and not by daylight. When the wind is not blowing, I also use natural light, particularly when the skies are overcast. Such lighting produces a nice shadowless light, but it also means you must use a very slow shutter speed, often as slow as 1/5th of a second. That’s the shutter speed setting you need because depth of field is your objective and the only way you can accomplish that goal is to retain the aperture setting of f-32. Obviously under these circumstances you need a tripod. When it’s all said and done, what you’ve got are images of some of the prairie’s most beautiful forms of life–plants such as the cone flower, which Indians once used to cure tooth aches; plants such as the salsify, which can actually be eaten, if you know when they’re edible and which parts are edible. In fact, most all these prairie species have stories they can tell, but that is the subject for another posting. This entry was posted on Monday, July 14th, 2008 at 5:33 am and is filed under Photography. You can follow any responses to this entry through the RSS 2.0 feed. You can leave a response, or trackback from your own site.